At some point, it seems inevitable that I'm going to mistakenly refer to David Fincher's anticipated Netflix series House of Cards as House of Lies. Potential title-confusion due to the name similarity to Showtime's drama series aside, the political drama certainly shows a lot of promise, with Fincher set to produce and direct, and Kevin Spacey starring and producing. 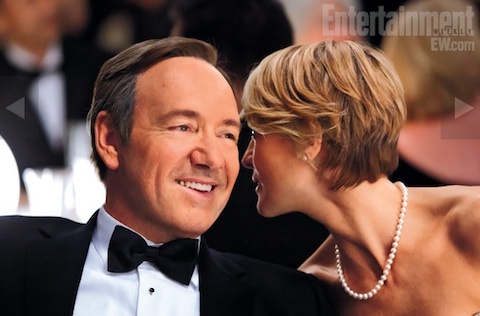 A photo from the series has made its way online, which gives us a look at Spacey and co-star Robin Wright. looking dressed up and smiling. A reboot of the BBC miniseries House of Cards, Netflix's streaming series is set in the U.S. and stars Spacey as a ruthless politician, with Wright playing his "ambitious" wife. Entertainment Weekly posted the photo below, which reveals a dapper looking Spacey, tuxedo up for some event and smiling as his wife whispers something into his ear. Unsurprisingly, both look pretty great all dressed up. I especially like Wright's hair. According to EW's caption, Spacey describes his character as a "wily, murderous politician worming his way to the White House." Not only does that sound like an interesting premise for a series, but it sounds like a great role for Spacey to play. Unfortunately, we still have to wait until next year at some point for the series to debut on Netflix, but if it lives up to its potential, it'll be worth the wait. As Spacey puts it, House of Cards "ain't your daddy's West Wing." Funny he should reference The West Wing, as WW creator Aaron Sorkin worked with Fincher on The Social Network and is getting back to small-screen work with HBO's The Newsroom, another series with a strong cast, potential political elements and a lot of promise.